The most elementary way to define the Michigan Supreme Court is as a group of individuals who come together to interpret justice. However, it is the interaction between unique individuals that makes the Court function.In order to understand the decisions and actions of the Court, it is helpful to look at the individuals involved in those decisions. By looking at their background and experiences, one gains a clearer understanding of their actions on the Court. The biographies that follow are thumbnail sketches of the Justices of the Michigan Supreme Court since Michigan became a territory, and they are designed to entice readers and researchers into learning more about Michigan’s rich legal history. 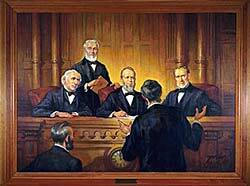 The Justices are not only crucial to Michigan history, but to United States and world history as well. They have served in many local government positions and organizations. They have interacted with presidents from Thomas Jefferson to Ronald Reagan. They have protected the people of United States since the beginning of our nation by serving in the Revolutionary War, through Civil War, and during the global conflicts of both World Wars. Readers should note the interesting lives many of these individuals led. The early justices were pioneers of Michigan; many overcame adversity and oppression, and all of them put their humanity and character on the line to serve the citizens of Michigan as jurists.